Audio visual links: Does technology promote fairness? Lessons from America: Future shock? In a speech delivered to the Society of Trust and Estate Practitioners in March 2016, the author traces through the development of the concept of promissory estoppel, and analyses it, while at the same time questioning its categorisation as an estoppel. The author examines the possibility that promissory estoppel is not one principle at all but a label covering six different but related equities. Six related situations where equity considers it unconscionable for a person to renege after making a promise which another relies upon. The author explains that this discussion is complicated by the considerable differences in how promissory estoppel is considered in Australia and England and even between New South Wales and Victoria. The High Court of Australia has produced four cases where the judges’ reasoning often conflicts, leaving it to State courts to distinguish High Court material that does not fit their taxonomy. The author concludes that promissory estoppel is an area of law under development and looks forward to the day when the various theories are melded into a viable principle. Magna Carta’s 800th anniversary saw much celebration and commentary about human rights in articles and conferences. Commercial lawyers should read that material carefully because, post 2011, international human rights standards apply to companies’ decisions and actions. Even where a business has fully complied with all domestic law, if that law is inconsistent with international human rights standards, there are increasing legal implications for the business. In Australia, this includes a mediation process overseen by a Commonwealth Government official, through the OECD Guidelines for Multinational Enterprises. The law is developing, and relatively unknown, but any lawyer advising a business client needs familiarity with these areas. This article summarises the current human rights standards and procedures relevant to commercial lawyers in Australia, both in advising their clients and also in conducting their own practice. 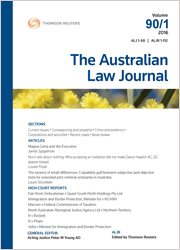 For the PDF version of the table of contents, click here: ALJ Vol 90 No 12 Contents.